When I was 11 years old my parents sent me to boarding school. It actually wasn’t as bad as it sounded. In many ways it was a big adventure to make new friends and be out in the world on my own. I learned some big lessons that year. But the thing that really stuck with me was how amazing my mum’s cooking was. And just how bad boarding school food could be. And the texture. Always of mush. So it’s not surprising that I grew up to be a fan of ‘al dente’ crunch in my vegetables. But recently I’ve had a change of heart. It all happened, as the best cooking discoveries tend to happen… by accident. I was ‘steam-frying‘ a pot of broccoli to have with my poached eggs one morning and got distracted with Fergal. Next thing I knew my broccoli had nothing resembling any crunch left. I LOVED my super tender broccoli ‘mistake’. The flavour was more subdued and it just melted away in my mouth. I couldn’t wait to have more. I love this broccoli with a poached egg and some home made mayo for breakkie. But lately, I’ve found myself doubling up for more super tender ‘broc’ with sardines or tuna and lashings of lemon juice for lunch or a simple supper. 1. Place a medium saucepan on a medium high heat. Add a drizzle of oil, the chopped broccoli and a big splash of water. 2. Cover and cook for about 10 minutes, stirring every 3-4 minutes and adding more water if it starts to burn. 4. When the broccoli is no longer crunchy, season generously with sea salt and pepper. 5. 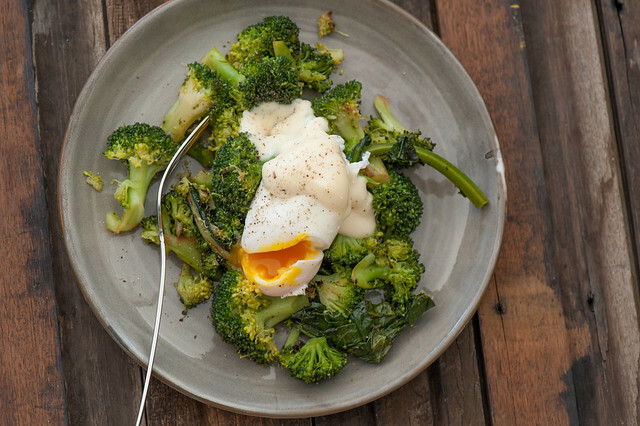 To serve, divide broccoli between two plates and top with poached eggs and mayo. vegan – skip the eggs and serve broccoli with a big dollop of hummus. different protein – i love sardines, tuna or salmon instead of the egg. Its also lovely with shaved parmesan or a sharp goats cheese. Great with grilled steaks or pork chops. side dish – skip the egg and mayo and serve broccoli with a splash of lemon juice anywhere you’d normally serve a green salad. different veg – try asparagus, kale, cabbage, chard (silverbeet), spinach or broccolini. ps. Want to win a free spot in my next online cooking program? To enter, just take a minute for my survey over here. And don’t forget to include your email address so I can contact you if you’re the lucky winner! Cook the broccoli till soft then mash with potatoes and butter, serve with boereworst or any kind of sausage sprinkle some vinegar over on your plate even the kids will eat it. Right A Collet! I’m going to try this on Fergal! Broccoli cooked, then blended with chicken stock makes a lovely dairy free soup. Roast broccoli until the edges crisp and even char a bit. Try cooking it with a squeeze of lemon, crushed garlic, or sea salt. I like it raw in a salad with pine nuts and a little bit of dijon mustard and lemon juice. No dijon mustard in your fridge? Simple mayo with lemon juice is good too. I agree with Amber … char-grilled / roasted is really good. If not roasting with other veg, I just steam in my bamboo steamer until el dente. I also enjoyed “…broccoli…having that dull army green thing going on”. That’s droll. I just boil mine in a little water til the water is just on a rolling boil. Then I drain the water and add half a squeezed lemon (to an average head of chopped broccoli), some salt and pepper. Delish! Oh I love lemon and broccoli together Julie! Forget the vinegar when you do poached eggs. Put the eggs to be poached into a shallow bowl. Bring water to a hard boil in a saucepan. Slide the eggs into the boiling water, cover the pan & remove from the heat. In the time it takes to toast & butter a couple of slices of bread the eggs will cook & be ready to serve. Take your time. I’ve tried lots of different vinegar-free options and they never work as well for me Jill… Thx for sharing your thoughts! I’m not sure I could do broccoli as a major breakfast ingredient, but with the poached eggs it sure looks good. The way I usually cook broccoli is to steam it. I usually try for soft (but not overcooked) because that’s the way my husband likes it. I prefer it soft or with a very little crunch – for some reason I don’t care much for raw or undercooked broccoli. Broccoli is really great for breakfast Susan! I love the idea of broccoli for breakfast, add a little hollandaise sauce for Sunday brunch would be perfect for guests. Over-cooked broccoli is delicious but you’re also cooking away a lot of the nutrients. If you do boil in water, save the water which is loaded with vitamins and use it for soup or whatever. I like to blanch the broccoli in salted boiling water for 3-4 minutes, then transfer it to an ice water bath to stop it cooking further. Keeps its color bright green and keeps the florettes from getting mushy or falling apart, but still cooked through. Then I gently warm it back up in a saute pan, drizzled with olive oil. Yum! I’m too lazy to boil first Jeffrey… But sounds delicious! Yippee, a video and a new way to cook veggies, two of the best aspects of your blog. A glug of oil and a splash of water and there you go….can’t wait to try this. I like to chop it up and sprinkle a mixture of bread crumbs, olive oil, salt, pepper, lemon zest and parm cheese over the top and roast it in the oven until it is browned on top. It’s very good! 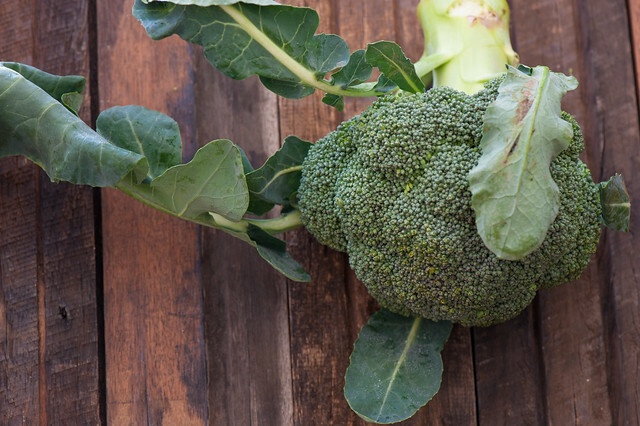 Cut the broccoli into florets and blanch them … barely two minutes, less is better. Toss them into a saute pan with a half dozen rashers of thick bacon cut into a two-inch dice. When the bacon is done the broccoli is perfect. Add a fresh grind of Tellicherry black pepper, Himalayan pink salt and a couple of scratches of nutmeg. Interesting to add nutmeg Daryle… Love the sound of the bacon! I chop it small, drizzle it with a little olive oil and sea salt, and roast it at 400 degrees for 20 minutes. It is like a deliciously healthy alternative to popcorn. I love to roast my broccoli! Tossed with olive oil and a bit of salt, roasted until it’s crispy at the edges. Delicious! I can’t believe there is someone else who loves ‘well done’ broccoli with a poached egg for breakfast! I started to do it as a change from kale and eggs and now it’s my Saturday morning go-to. With some home strained labne or some hummus but I will try Mayo. Chilli and lemon good ideas too. Broc roasted with king prawns (good quality local frozen ones) is amazing too and super simple. Maybe I read that here actually…..?